For the past 18 years, journalist and chef KIM O’DONNEL has dispensed cooking advice for numerous publications, including the Washington Post and USA Today. The first Meatless Monday blogger on record, O’Donnel is the author of The Meat Lover’s Meatless Cookbook and The Meat Lover’s Meatless Celebrations. She lives in Seattle. "It’s not an exaggeration to say: Kim O’Donnel helped turn me onto vegetable-focused cooking." "...especially appealing are O’Donnel’s instructive, encouraging tips and kitchen notes that remove obstacles almost before they can be formulated." "The recipes, including many gluten-free and vegan options, spark with lively ingredient combinations. But especially appealing are O’Donnel’s instructive, encouraging tips and kitchen notes that remove obstacles almost before they can be formulated." "Seattle cookbook author Kim O’Donnel’s new book will expand [your] cooking repertoire with a focus on local, seasonal veggies." "Healthy and simply delicious vegetables are at the heart of this cookbook." "A new cookbook that celebrates the bounty of the Pacific Northwest." "Amazing photos of plated masterpieces." "Local produce finds its way into every meal in another book by Meatless Monday pioneer Kim O’Donnel. Through beautiful photos and more than 100 recipes, O’Donnel’s argument for eating more veggies is pretty convincing." "Makes the special flavors of the Pacific Northwest accessible to home cooks, no matter where they live." "Every so often, a vegetarian book comes along that demands home cooks sit up and take notice. This is one of those books that will both inspire and delight..."
"Highlights include desserts, frittata, and black bean and beet burgers." "Beautiful photographs and crave-worthy food await you this ode to the Pacific Northwest." "[This book has] all sorts of fresh ideas for cooking regional delicacies." "If one person understands just how much Portlanders love their veggies, it’s Kim O’Donnel. PNW Veg… dish[es] out ways to make the most of the abundance of vegetables in the Pacific Northwest." "Celebrates the produce of [O’Donnel’s] Pacific Northwest home." "No matter your level of cooking or vegetable expertise, you'll feel at home in this cookbook. O'Donnel covers the basics and offers helpful tips throughout to give further insight into the recipes." "Kim O’Donnel is a master of incorporating more vegetables into her meals, [with] locally sourced, seasonal ingredients." "I need to get my co-host a copy!" "Offers 100 healthy vegetable-based recipes that take full advantage of the resources provided by the Pacific Northwest region." "As my eating habits have changed, I’ve continued to be inspired by Kim O’Donnel’s work." 'The recipes are applicable to kitchens everywhere, and even the ones with esoteric ingredients like fiddlehead ferns (turned into fritters and dipped in an herby ginger sauce) can be made on [the east] coast." "Vegetarians and omnivores alike will be eager to eat their vegetables, and the convenient gluten-free and dairy-free symbols make navigating the book a breeze for reader with dietary restrictions. It is perfect in offering ideas for every meal of the day for people who are working to incorporate more veggies into their diets." "Make this your new summer cookbook!" 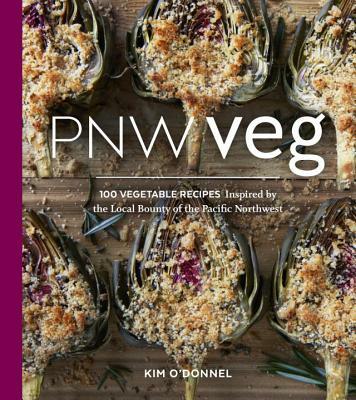 "PNW Veg offers satisfying, uncomplicated recipe ideas for people who are working to incorporate more vegetables into their diets."